This ingenious device will turn your Frontier Pro Water Filter into a water heater filter. Simply attach your Frontier Pro filter to the water heater drain valve to provide safe clean water for your family in the event of an emergency. Turns your Frontier Pro into a Water Heater Filter: Taps into usable water supply in emergency situations. Easy to Use: Uses standard threads to connect to the water heater drain valve. Replaceable Pre-filter: Protects the micro filter and can be easily changed out when plugged. Cleanable Stainless Steel Screen: Removes larger sediment and can be easily cleaned. Will not rust and incorporates integrated seal. Over time harmful sediments build up in your water heater tank. The water heater design prevents the majority of these sediments from entering the water stream when installed correctly, and when operating under proper line pressure. The stored water may be used in an emergency, by draining the tank, but draining the tank from the drain valve releases these harmful materials into the water stream. The sediments must be removed prior to use. To remove harmful sediments and make the stored water usable. Attach the Water Heater Adapter to the base of your Frontier Pro Filter. Remove the Bite Me™ Valve and attach the Frontier Pro Filter to the drain valve of the water heater. Open a faucet at a high point in the house to allow air to replace the water in the tank, then open the drain valve and place something under the filter outlet to collect the water. 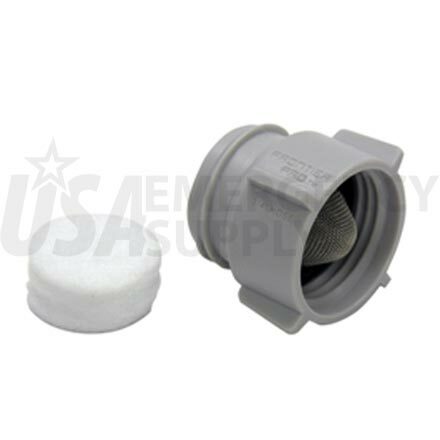 Replaceable pre-filters and a cleanable screen protect the filter element from premature plugging due to high sediment load. Simply clean off the screen and replace the pre-filter element as needed.